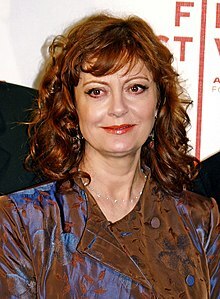 Susan Abigail Sarandon ( née Tomalin; born October 4, 1946 ) is an American actress and activist. She has received an Academy Award, a British Academy Film Award, and a Screen Actors Guild Award, and has been nominated for six Primetime Emmy Awards and nine Golden Globe Awards. She is known for her social and political activism for a variety of causes. She was appointed a UNICEF Goodwill Ambassador in 1999 and received the Action Against Hunger Humanitarian Award in 2006. Her other movies include Little Women (1994), Anywhere but Here (1999), Cradle Will Rock (1999), The Banger Sisters (2002), Shall We Dance (2004), Alfie (2004), Romance & Cigarettes (2005), Elizabethtown (2005), and Enchanted (2007). 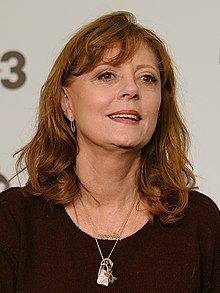 Sarandon has appeared in two episodes of The Simpsons, once as herself (" Bart Has Two Mommies") and as a ballet teacher, " Homer vs. Patty and Selma". She appeared on Friends, Malcolm in the Middle, Mad TV, Saturday Night Live, Chappelle's Show, 30 Rock, Rescue Me, and Mike & Molly.